Project manager John B. Hynes IV and the Rev. James Flavin at the new site of Our Lady of Good Voyage. 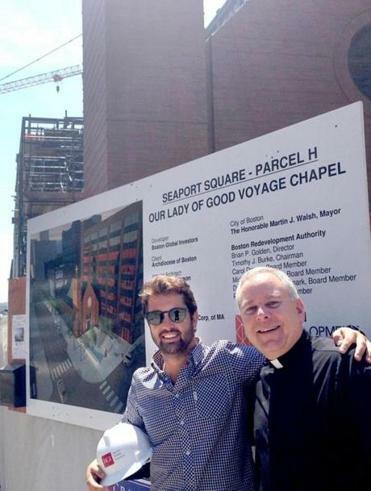 John B. Hynes III, who runs Boston Global Investors and has put up a boatload of buildings in the Seaport, was looking at some plans one day and realized that right smack dab in the middle of Northern Avenue where he wanted to put a 22-story office building was an old church, Our Lady of Good Voyage. Cardinal Richard Cushing built the church back in 1952, when Hynes’s grandfather was the mayor of Boston, and so Hynes was sitting there at his desk, thinking of all that history, staring at the plans and repeating two words in his head: third rail. The negotiations were a little more complex and far more respectful than that, of course, but in the end it came down to Hynes and his investors doing a $10 million deal to buy and tear down the old church and build a new one at the corner of Seaport Boulevard and Sleeper Street, in what used to be a parking lot. Initially, the idea was to provide the archdiocese 5,000 square feet of space in an office building. It would be the most high-end storefront church in a city where storefront churches are confined to neighborhoods that are decidedly not high-end. But the more they talked about it, the more Hynes and Cardinal Sean O’Malley agreed a freestanding church made more of a statement, for an archdiocese that is trying to get its groove back, and for a burgeoning collection of buildings and businesses still searching for its own identity as a real Boston neighborhood. Taking Joni Mitchell’s plaintive complaint to heart, they didn’t pave paradise and put up a parking lot. They paved a parking lot and offered the promise of paradise. The Seaport is full of million-dollar condos, $70 steaks, endless choices of tequilas, and really smart, young people. Infusing it with some spirituality is welcome and overdue, a melding of the old and new, a signature moment, both for the city’s fastest-growing area and one of its most enduring institutions. For the better part of a generation, the Archdiocese of Boston has been in decline, in the business of closing down and selling off churches. In the immediate aftermath of the sexual abuse scandal that rocked the church some 15 years ago, the archdiocese closed about 20 percent of its churches in 2004 alone. The Rev. Jim Flavin, the episcopal vicar for the archdiocese, said the new Our Lady of Good Voyage is the first new Catholic church built in the city in some 60 years. The original Our Lady of Good Voyage was meant to minister to fishermen and longshoremen and whoever else made their living on the gritty, smelly waterfront. The statue of Mary on the altar depicts her holding the baby Jesus in one hand and a three-masted ship in the other. She will be making the move over to the new church. Our Lady of Good Voyage always had the latest Sunday Mass in the city so it was known in Southie and other city neighborhoods as Our Lady of the Last Minute. It still has a late Sunday afternoon Mass, and someone who is regularly at that Mass is John Hynes IV, the son of the aforementioned developer. The younger Hynes is project manager for the new church. He is also the personification of the demographic of the Seaport. A Boston College grad, he is 29, one of the young professionals who lives in one of the towering buildings overlooking the harbor, in his case the Pier 4 building. After the late Sunday Mass at Our Lady of Good Voyage, Hynes, his girlfriend, and their friends decamp to one of the Seaport’s myriad watering holes to chat. Last week, they sat on the deck of the Lookout Rooftop and Bar at the Envoy Hotel, one of the Seaport’s trendiest outposts. Hynes and his contemporaries defy some yuppie stereotypes. Father Flavin is not just a priest. He’s a licensed psychotherapist, attuned to mind and soul. He said the archdiocese carried out research before committing itself to a new church in a new, emerging neighborhood. Flavin said more people go to Alcoholics Anonymous meetings in Boston’s churches than to Mass. They want to tap into that recovery community, among others. Retired priests are like former Marines: There is no such thing. The allegedly retired priests at Regina Cleri in the West End will be called on to staff the new church, which will be ready by next year. The archdiocese will spend a couple of million to outfit the new church, and Flavin hopes some of the wealthier residents of the Seaport will step up. With room for 300, and in that location, the new church will become a wedding magnet. A couple of weeks ago, when they raised the 14-foot cross that sits atop the new church, Father Flavin looked around at the construction sites that ringed them. It was a sign, a reminder that a neighborhood without a soul is no neighborhood at all.